Various types of slow earthquakes have been detected on plate interfaces near the seismogenic zones of megathrust earthquakes. We investigated long-term changes of deep very low frequency earthquake (VLFE) activity over a period of 13 years in Shikoku region, southwest Japan. VLFEs can be categorized as slow earthquakes. VLFE activity is expected to be a proxy of interplate slips. In the Bungo channel (G1 of Figure 1), where long-term slow slip events (SSEs) have been known to occur frequently, the activity of deep VLFEs was modulated by long-term SSEs in 2010 and 2014. VLFE activity is sensitive to the size and area of the neighboring long-term SSEs. In the neighboring inland region (G2 of Figure 1), deep VLFE activity is accompanied by episodic tremors and slips every 6 months. In western Shikoku, the activity of deep VLFEs and tremors has been low since the latter half of 2014 (Figure 2). This decade-scale quiescence may be attributed to the change in interplate coupling strength in the Nankai subduction zone. Figure 1. Analysis area. The position of grids is shown by numbers. 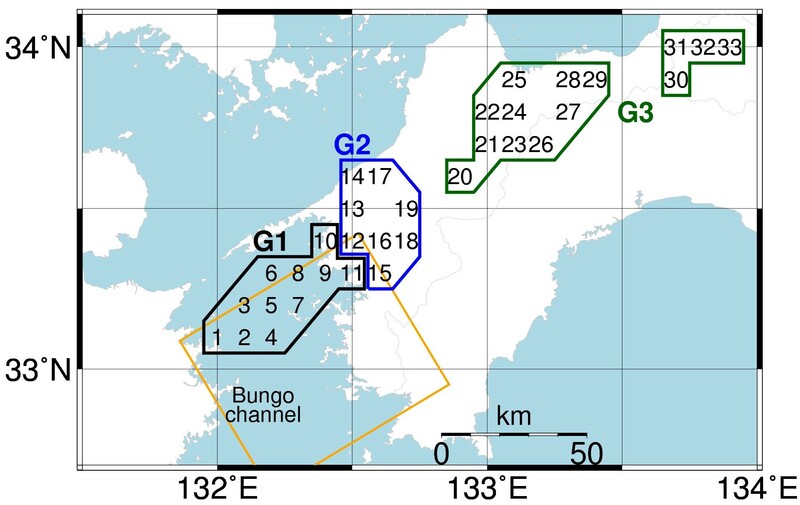 The areas surrounded by polygons denote the groups (G1, in the Bungo channel (black); G2, near the Bungo channel (blue); and G3, apart from Bungo channel (green)). 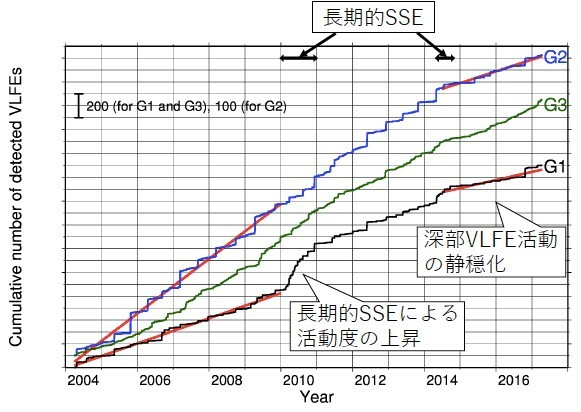 The orange rectangle shows the estimated fault plane of the long-term SSE in 2010 (Hirose et al., 2010). Figure 2. Temporal changes in the activity of VLFEs from April 2004 to March 2017. The black, blue, and green lines show the cumulative number of detected VLFEs in G1, G2, and G3, respectively. The cumulative number of each group contains events of all the grids in that group. The horizontal black arrows show the period of long-term SSEs in 2010 and 2014 (Ozawa, 2017). The red lines are the regression lines from April 2004 to December 2009 and from July 2014 to April 2017.